This Hanukkah Menorah is designed by Yair Emanuel of Israel. 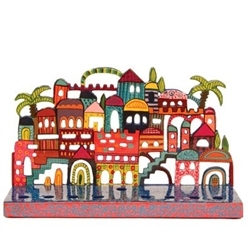 The candles fit into the base and are complemented by the laser cut design of a Jerusalem scene. 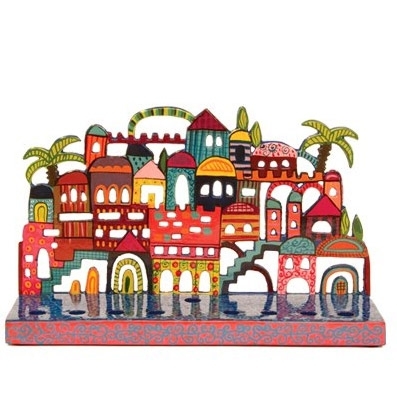 The beautiful shades add a vivid blaze of color to the holiday of light.The piece is hand-painted and then covered with three layers of lacquer, making it totally functional. The Menorah is waterproof and may be hand-washed. 9" X 2.5" X 5.5"